One more brief post about Sylvia Plath and Cambridge that has grabbed my attention since the recent story about the skeletal remains of a woman, mouse & shrew to be back on exhibit in Cambridge after a long storage away from the public's eye. Sylvia Plath is considered a "Cambridge Author." It is on the website just linked to where we find something quite interesting about Plath's course in Tragedy. What you will find is "an examination of her work in the light of her academic experience in Cambridge. She studied the Tragedy paper - a cornerstone of the course from the very start - and resonances with the material she read for it can be identified in her writing." The site is broken into different parts, one being "Sylvia Plath and the Tragedy Paper." One of the more interesting pages and links appears in the section "The Tragedy Paper: Continuity and Change." It is here that a link is included to a PDF of the actual exam paper/test Plath took on 29 May 1957, which was 55 years ago today. As she read for the Tragedy paper, Plath caputured some of the exhaustion-inducing prepartion she was doing, such as in this letter to her mother from 28 April 1957: "I am living at the University library from morning to night... enjoying my work, really, steadily reading tragedy now, the Greeks, then on through 2,000 years up to Eliot, concentrating on several major figures: Corneille, Racine, Ibsen, Strindberg, Webster, Marlowe, Tourneur, Yeats, Eliot; there are so many. This tragedy paper (only a 3-hour exam for all that) is a fine help on my reading" (308). The morning of the paper, Plath wrote, "I am taking time early this sunny morning to limber up my stiff fingers in preparation for my Tragedy exam this afternoon..." (314). All in all a very good, interesting website. Thank you English department at Cambridge University. Plath's papers from her two years at Cambridge are largely -if not all- held in Plath mss II. at the Lilly Library, Indiana University at Bloomington. Some of her papers and books from this period are also there. An examination of these papers and books and notes and the English/British education of Sylvia Plath might make a fine paper for someone to submit to Plath Profiles? One of the reviews of the first Faber edition of The Bell Jar, the first edition to appear in print with Sylvia Plath's name as author, was by Valerie Pitt, in The Sunday Telegraph, 25 September 1966. Pitt's review, titled "Isolated Case," praises the novel story as being told with "controlling definiteness" and "disciplined clarity," remarking that these are also qualities of Plath's poetry. Very true. Pitt's review ends, "It is a book to make one regret, increasingly, the early death not only of so brilliant a writer but of so uncommon a personality." Valerie Pitt evidently was a reader of Plath's poetry at the time of the review, commenting that "Not surprisingly, the publishers have have followed the success of Sylvia Plath's 'Ariel'" by issuing her novel under her own name. It is Pitt's comment about Plath being so "uncommon a personality" that strikes me as interesting. It is possible to ascertain something of a writer's personality from the material they publish. And naturally it is possible if you actually know the person, too. For Pitt, though, which is it? The answer, did you know..., was both! Plath & Pitt both took a course in French translation (Montaigne, Racine, Baudelaire, among others) as well as Practical Criticism in Cambridge. For her French Translation course at Cambridge, under the tutelage of Miss Anne Judith Barrett, Plath wrote the paper "Passion as Destiny in Racine." This paper, dated 3 March 1956 is housed now in Plath mss. II at the Lilly Library, Indiana University. And we of course remember that Plath used an epigraph from Racine for her poem "Pursuit." Another French writer Plath translated during this course is Ronsard. 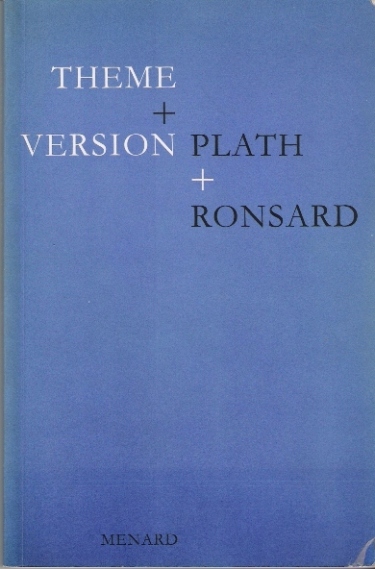 In 1994, the Menard Press published some of Plath's translations in Theme & Version: Plath & Ronsard. Pierre de Ronsard lived from 1524-1585. From the Inpress Books website, "This book [Theme & Version: Plath & Ronsard] presents the previously unpublished translations of Ronsard which Sylvia Plath made in 1956 or '57, during her time as a mature student at Cambridge. "Daniel Weissbort, who knew Plath there, contributes an essay on her approach to translation. Audrey Jones's essay discusses Renaissance iconography in Ronsard and its mediation through Plath's work. The third essay is by Yves Bonnefoy, on the significance of his great precursor." Plath studied with Miss Barrett during her first year at Cambridge, in 1955-1956. If you are interested in buying Theme & Version, copies are available via Inpress Books, Amazon, and ABEbooks. Additionally, libraries also hold this title, so check out this link to WorldCat to see if one is near you. Maev Kennedy at The Guardian just rocked my world with her news article, "Gnawed Roman skeleton that inspired Sylvia Plath poem goes on display." I'm so glad Kennedy mentioned that six years after penning the poem Plath killed herself because it is entirely relevant to the exhibit. Sarcasm aside, the embedded video is interesting, for video of the woman, the mouse, and the shrew, see about 4 minutes 22 seconds into it; though the whole video is well done. Although I received notice in February, it is only now that I realized I never posted about this archival update. The collection of Olwyn Hughes Correspondence is now open for research at the British Library. Back in September 2010, the British Library issued this press release about the acquisition. This blog made reference, too. Additional papers of Olwyn Hughes' are held at Emory University; visit the Archival Materials page over at A celebration, this is, for more information. You can access the full catalog descriptions of the collection via the British Library's website. To read the description of the collection, please go to the British Library search page, type in Add MS 88948, and you will see all the records which are applicable. The "details" option gives very good information on what is contained in each series/fonds. In addition to letters and poems sent from Sylvia Plath and Ted Hughes to Hughes' sister, which are bound to garner the most attention, the collection also include some of Olwyn Hughes' personal papers such as school reports, receipts, and other miscellaneous items. While more information is available on via the catalogue, the information contained in this blog forthwith is a summary of the materials originated by Sylvia Plath. Undoubtedly this expands our knowledge of Plath's communication with her sister-in-law, and offers potentially interesting variations to Plath's then in-progress poetry. As well, the documents related to or about Plath, both during her lifetime and those created after her death might give insight into how the Hughes family, their friends, and her enemies/detractors dealt with the situation. Add 88948/1: Letters from Ted Hughes and Sylvia Plath: Autograph and typescript letters written by Ted Hughes and Sylvia Plath to Hughes' sister, Olwyn. In the letters the couple write about their work, their travels, people they have met and their future plans. The letters include the period, which Hughes and Plath spent living in the USA. 10. Partial letter from Plath in which she writes about teaching at Smith College; on the development of Hughes' work and on how both of them used their experiences when writing. 9 February . 17. Partial letter from Plath in which she writes about the publication of some of her work and her job as secretary for the Head of the Sanskrit and Indian Studies department at Harvard. She also includes a cake recipe. 18. Letter to Hughes’ parents in which he writes about Yaddo in great detail describing the house and its grounds, the daily routine and the food they were served. 19. Letter to Hughes' parents in which the couple write about Yaddo and the other guests, and a play Hughes has written. 20. Letter to Olwyn in which Hughes writes about his new play and the work of Claudel and Brecht (11 November 1959). 21. Partial letter to Olwyn in which Hughes writes about French literature and asks her to forward a cheque that was being sent to him care of her address from the Guggenheim Foundation. 5. Letter from Hughes and Plath in which both comment upon a dinner they attended with Stephen Spender, Rosamund Lehmnann and Louis McNeice. Both also mention the forthcoming publication of The Colossus [October 1960]. 7. Letter from Hughes and Plath in which Hughes writes about his work including a production of a play that he has written. He also includes a poem, which he was sent in his role as one of the judges for the P.E.N. Anthology 1962. Plath writes about an art exhibition of Leonor Fini [before Christmas 1960]. 9. Letter from Hughes and Plath who thank Olwyn for sending copies of the plays of Francois Billetdoux who they both admired. Hughes also writes about his interest in ‘Elouard’ [Eluard] while Plath writes about their new life in Devon [Autumn 1961]. Autograph and typescript drafts of poetry and prose written by the couple and sent to Olwyn Hughes. Includes a partial play draft and some unpublished poetry by Hughes. 19. 'The Captain's Speech': an excerpt from The House of Aries , a play broadcast on the BBC as part of the Third Programme. The excerpt was also published in Audience and Two Cities in 1961. Plath has noted two submissions on the left hand corner of the draft. 2. 'Nocturne' and 'Departure of the ghost': published in The Colossus as 'Hardcastle Crags' and 'The Ghost's Leavetaking' respectively. Both poems differ from the published versions. 3. 'The Hermit At Outermost House': published in The Colossus. 4. 'Swords into Ploughshares' (also known under the alternative title 'Bitter Strawberries'), which has been annotated 'SOLD ... C.S. Monitor August 1950'. 6. Small piece of pink card on which Sylvia Plath has written notes under title 'Underground Man' (undated). 7. Two drafts of an introduction by Hughes to Plath's Crossing the Water, which was published in 1971 (one autograph, one typescript). The text seems to have been written to accompany a reading of poetry from the volume. Biographically, 50 years ago this weekend was a significant one for Sylvia Plath. It was that weekend that David and Assia Wevill visited Court Green. According to Plath's 1962 Letts Royal Office Tablet Diary, the Wevill's arrived on Friday 18 May. She made gingerbread and beef stew. At 6:40, Plath also had a note that there was a German program on the BBC. Saturday, 19 May, there was a full moon; and the day is clean from responsibilities save for Plath making a note about Nancy [Axworthy]. Sunday 20 May, the only note is that there was an Italian broadcast on at 3:10. And, of course, on Monday 21 May, Plath grabbed sheets of her typescript draft of The Bell Jar, turned the pages over, and wrote "The Rabbit Catcher" (originally titled "Snares") and "Event" (originally titled "Quarrel") because something went seriously wrong. Fifty years ago today, Sylvia Plath's The Colossus was published by Alfred A. Knopf in the United States. A small notice of the publication appeared in that day's New York Times, on page 26. On 1 May 1961, a year before publication, Plath headed her letter to her mother, published in Letters Home: "GOOD NEWS GOOD NEWS GOOD NEWS!" (417). Plath admitted, "After all the fiddlings and discouragements from the little publishers, it is an immense joy to have what I consider THE publisher accept my book for America with such enthusiasm. They 'sincerely doubt a better first volume will be published this year.'" (417-418). At the end of the letter Plath tells her mother that "I have been writing seven mornings a week at the Merwins' study and have done better things than ever before, so it is obvious this American acceptance is a great tonic" (418). The poems Plath wrote at this time were "In Plaster," "Tulips," "I Am Vertical," and "Insomniac." However, Plath was largely at work on The Bell Jar. On 14 May 1962, Plath wrote to her mother: "My book officially comes out in America today. Do clip and send any reviews you see, however bad. Criticism encourages me as much as praise" (454). A brief review in Plath's hometown newspaper, The Boston Globe, appeared on 3 June 1962, on page B22. The reviewer, Herbert A. Kenny, said Plath "writes her poetry with a directness and at time a minor brutality of image that sets her apart from most women poets. Her poems assume a power and poignancy as in her recollections of her grandmother at Point Shirley in Winthrop, one of the finest poems in the book." He continued the brief review by saying, "If some may find in her lines that 'the rats cry out' too much, the skill in language and the vivid workmanship are a compensation, and there is humor." A bit belated, but, CONGRATULATIONS! I am working on another post to do with The Colossus that should appear in a few weeks. If anyone cares to guess on what aspect of it - and guesses correctly - you will have our unending respect. On 29 March, this blog mentioned a new novel that features "people who are obsessed with Sylvia Plath." Naturally my interest was piqued. 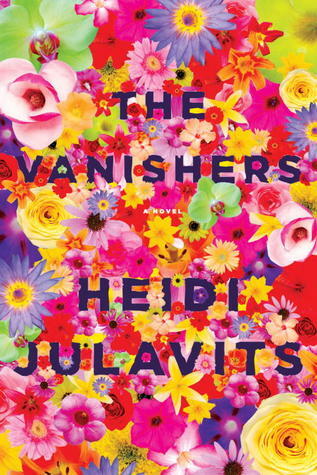 The Vanishers by Heidi Julavits asks, to quote from the promotional page on Random House (Doubleday imprints) website, "Is the bond between mother and daughter unbreakable, even by death?" To continue an unoriginal review of the book, "Julia Severn is a student at an elite institute for psychics. Her mentor, the legendary Madame Ackermann, afflicted by jealousy, refuses to pass the torch to her young disciple. Instead, she subjects Julia to the humiliation of reliving her mother's suicide when Julia was an infant. As the two lock horns, and Julia gains power, Madame Ackermann launches a desperate psychic attack that leaves Julia the victim of a crippling ailment." It is a good book and a relatively quick read. To say it is thought-provoking might be tongue in cheek. I kept wondering if such a thing as psychic attacks is in fact possible. If there is, please, to quote Tom Petty, "don't do me like that." There are of course Plath references throughout the book. I was impatient to find the first instance of direct mention, and had to wait 71 whole pages! Then they came with some regularly on pages 83 [obliquely], 88, 89, 131, 143, 215, 246, 248, 256, and 263. In the novel, Julia's step-mother Blanche introduces her to Plath. 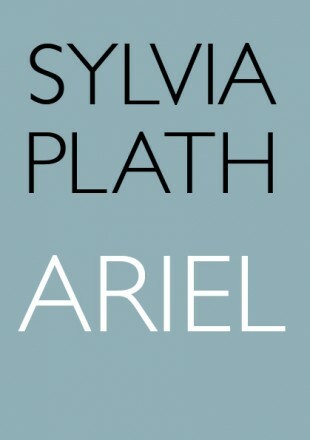 Blanche"insisted" that she and Julia "memorize Plath's Ariel; the poems, she said, might help me understand why my mother had done what she'd done [killed herself]" (71). Plath is used in the novel in several ways. There are the poems that are quoted, such as lines from "The Applicant," "Death & Co.," "Daddy," and The Bell Jar; but it is "Death & Co." and the suicide that are most frequently referred to. On page 88, I think, is the best Plath reference and that is to photographs of Plath. Julia Severn says, "no matter how many photographs I'd seen of her, I had no idea what she looked like. Each photograph undermined the believability of the others, as though she'd been, even while alive, unwilling to commit to her own face" (89). This is something I have often felt about photographs of Sylvia Plath, that is it hard to reconcile one from the other as the light, the angle, the photographer each was able to bring out a different expression, and therefore capture a different Sylvia Plath from one moment to the next. In addition to the Plathian references, one of Julia's acquaintances in the novel is called Alwyn: and the similarity to Ted Hughes' sister, Olwyn, is unmistakable. Last Sunday's episode (6 May) of Mad Men was called "Lady Lazarus" which has lead to about 1,000,000 news stories online making a connection to Sylvia Plath. Thanks to Jamie Hood for this link to a Slate.com interview "Sylvia Plath in Mad Men" by Julia Taylor. Julie Buckles has published recently an article in the Ashland Current titled "In Pen and Ink, Poet Plath Captures Cornucopia Harbor." The article, a great one, greatly benefited from information provided by a deep friend in Plath, poet and author David Trinidad, whose Plath Profiles 4 essay "On the Road with Sylvia and Ted: Plath and Hughes's 1959 Trip Across America" explores Sylvia Plath and Ted Hughes' cross country trip in the summer of 1959, which included their brief stay in Wisconsin. The article looks at Cornucopia today and considers Plath's pen and ink sketch of the harbor, as was recently seen and sold at the Mayor Gallery's 2011 exhibit "Sylvia Plath: Her Drawings." 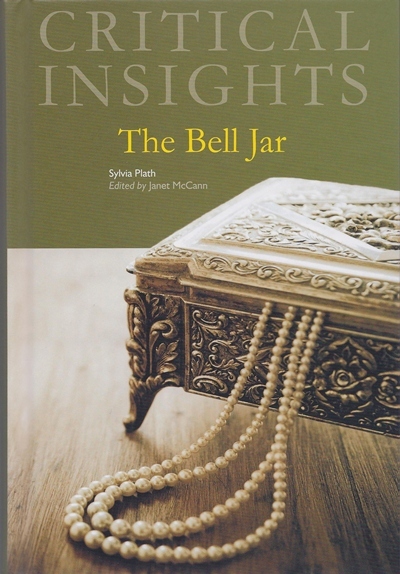 Published earlier this year is a collection of essays on The Bell Jar edited by Janet McCann of Texas A&M University. The material includes eight new essays on The Bell Jar and reprints ten essays from the past. This is a valuable book on a book that receives far less critical attention than its cousins, the poems. Let's look at what's in the book and I will continue blithering below. "The Fig Tree and the Black Patent Leather Shoes: The Body and its Representation in Sylvia Plath's The Bell Jar" by Nóra Séllei. As with any book, the reader takes out of it what they want, as well as what the bring to it with prior reading and knowledge and passion for the subject. I particularly love The Bell Jar, so its faults notwithstanding, I really enjoyed this selection of essays . The Garry M. Leonard should be required reading and of the new essays, lets add Pamela St. Clair's "Sentient Patterning in The Bell Jar" and Allison Wilkins' "'The Domesticated Wilderness': Patriarchal Oppression in The Bell Jar." I enjoyed too Ellen McGrath Smith's "Sylvia Plath's The Bell Jar: Critical Reception" as this kind of thing floats my boat. The older essays reprinted seem to stand on their own, though a couple (Bayley and Lestienne) felt out of place to me: the focus is less on The Bell Jar in these two essays and more on the poems and/or Woolf. The essays are excellent, mind you, but do not belong in this book. The mistakes that were present each essays first appearance persist, and in an ideal world the authors and/or editor might have been able to touch these up a bit. 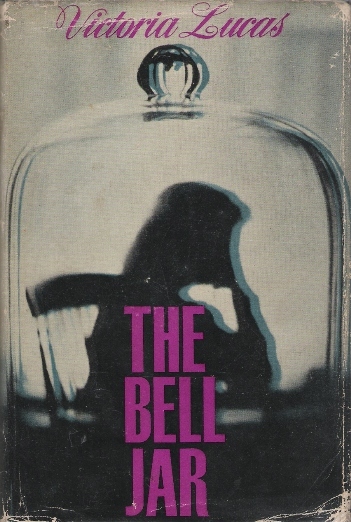 For example, Bayley claims The Bell Jar was written in "the late 1950s" (133); Hoogland that Heinemann accepted the novel only after several American publishers rejected it (282); and Baldwin in a footnote called Marco by a wrong name, Rico (177). Each of these instances are inaccurate. The citation style, also, throughout the text is inconsistent, particularly with the older essays. Of the newer essays, the errors rampant in the beginning Dunkle's essay turned me off severely but the text smooths itself out. And unfortunately there is a decent amount of overlap in the approach to interpreting the novel (topics discussed focus on historical and cultural situation of America in the 1950s and Cold War narratives/themes). If these were all essays published in different journals we might not notice it as much, but as they appear one after the other it rather has the effect of redundancy. Having online access included in the price is a nice touch as it gives one the chance to have full-text availability. Sylvia Plath's "queer and sultry summer"
The Guardian recently ran "The 10 best first lines in fiction." The first lines of Sylvia Plath's novel The Bell Jar made the list, coming in at number 8. Of course the blurb under the quote has it a little wrong: Plath died about a month after it was published, not the month before, but whatever...It's only the details, right? At some point, The American Book Review ran the top 100 lines, and The Bell Jar finished 67th. A new translation of Plath's Ariel (as in the manuscript she prepared in late 1962 and that was subsequently, finally published in 2004) has been published in Sweden by Ellerströms. The translation was undertaken by Jenny Tunedal and Jonas Ellerström. For those who speak and read Swedish, there are two reviews of this new book that might be of interest to you. The first appeared in the newspaper Jönköpings-Posten, and is by Björn Kohlström, and another in Svenska dagbladet, which is one of Sweden's biggest newspapers If you are interested in reading them in English, try Google Translate but keep in mind it will be imperfect. While the main part of the text adheres to Plath's ordering of poems (the book ends with "Wintering"), there is an appendix of fifteen poems, including "Words" and "Edge." The book is attractively designed by Clara Möller. Thanks to both Björn Kohlström and Florian Flur for information on this title.